It’s a warm day in early fall, and you’re tailgating at the first home football game of the season. You skipped lunch so your stomach is grumbling, but not for long. A row of pink, meaty hot dogs sizzle on the George Foreman grill next to you, and you bend down to grab one. You cradle the blazing dog in a flaky bun, and it’s time to add condiments. You remind yourself that with great power comes great responsibility, and you don’t want to mess this up. Follow the guidelines below to create the quintessential Chicago-style hot dog and you will never be dissatisfied by your dog again. There are a few unspoken rules about Chicago-style hot dogs, perhaps the most important being the lack of ketchup. In recent years, people have started to associate the tomato-based product with hot dog consumption and often lump the two together as husband and wife. Pop culture has given people the false perception that a bun should be seedless, when in fact the opposite is true. A true Chicago dog is made on a poppy seed bun. While the origin of this tradition is unknown, it has since become a signature part of the authentic Chicago dog. Unfortunately, if you attempt to make a Chicago dog without the crucial poppy seeds, you are considered an imposter. Here is when it gets good. The first ingredient is yellow mustard. The trick is to swirl the mustard in a zig zag motion along the length of the hot dog, leaving half inch gaps between each zig and zag. Next up: relish. The preferred Chicago-dog kind is lime green relish, which is rich in flavor and perfectly diced. After the relish, comes a sprinkling of onions. Heavy on the relish, light on the onions. 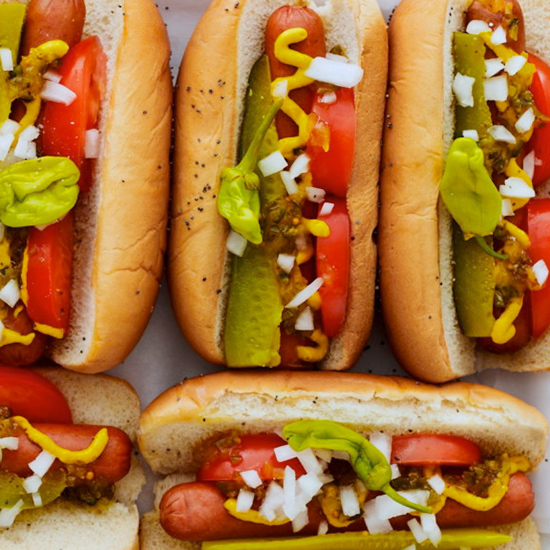 The “salad” portion of the hot dog — tomatoes, pickles and sport peppers — is crucial. This is where some people get lazy, but keep pushing, it will be worth it. The tomatoes have to be strategically placed in the crease of the bun, and the pickle spear must be placed opposite the tomatoes. This crunchy fella adds the perfect complement to the sweet relish. Next, two sport peppers are placed atop the pile of goodies — facing the same direction as the tomatoes, obviously. The final piece of the puzzle — the celery salt — is lightly sprinkled over the entire hot dog. With a perfectly made Chicago dog in hand, the next logical step is to eat it. For more rules of Chicago dogs go to SpoonUniversity. What’s Up With All The Hot Dog Carts Around Campus?